In what could be regarded as a defining moment for civil society activism in Nigeria, the organised civil society in a plethora of submissions to the Nigerian parliament, have resisted plans to use restrictive legislation to shrink the civic space in the country. This happened at the public hearing on the NGO Bill held on December 13-14, 2017 in Abuja, FCT, Nigeria. The House of Representatives’ Committee on Non-governmental Organisations and Civil Society Organizations invited stakeholders to the public hearing to make presentations on the Bill introduced by Mr. Umar Buba Jibril representing Kogi State in the House of Representatives. 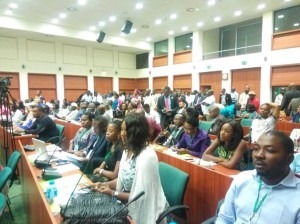 Hundreds of representatives of local and international non-governmental organizations (NGOs), private interest groups, government departments, professional bodies, labour unions, clerics, development practitioners, media firms, academics and so on, thronged the National Assembly Complex, the venue of the the public hearing, to voice their dissent to the legislative proposal. Among other objectives, the bill, popularly known as the NGO Bill, seeks to supervise, coordinate and monitor nongovernmental organizations (NGOs) and civil society organizations (CSOs) in Nigeria. It proposes to establish an NGO Regulatory Commission with far-reaching powers of oversight and regulation over the affairs of NGOs operating in the country. A number of provisions in the bill are not only contentious, but also, indicate plans to enlarge governmental powers to interfere with the operations and funding of civil society groups and NGOs, while subjecting their activities to the whims and dictates of government. Expectedly, the bill attracted Nigerians from all walks of life committed to the enthronement of a free, and truly democratic civic space. In unison, they condemned and rejected the proposed Non-Governmental Organisations’ Regulatory Commission Bill. The Catholic Bishop of Sokoto, Bishop Matthew Hassan Kukah made a graceful appearance at the hearing. Delivering a speech that was punctuated with thunderous applause from the crowd, the respected Catholic Bishop stated that he stands the civil society. Without civil society, democracy would be in danger. He reminded that Nigeria has so many laws covering what this bill is seeking to do. The civil society is central to democratic governance and performance and that formed part of the reason why he set up the Kukah Center. The debate is important because the political class has developed a feeling of disregard for the value of civil society. Although the intentions of the bill are noble, the approach needs to be reviewed. The Bishop ended his speech by saying that while both the legislature and the civil society are working for the good of the society, their approaches may differ. They should all exist together and work for the good of the nation. Comrade Abdul Oroh, human rights activist, founding member of the Civil Liberties Organisation and a member of the 5th Assembly also lent his voice to the bill. He asked the House Committee to ‘kill the bill, as it does not serve any useful purpose’. The real intendment of the bill is to cripple civil society and block room for interrogation of government policies. The civil society is a force for good and does not need the current attempt to cripple it, he said. Setting the modus operandi of the meeting, the Chairman of the House Committee on Civil Society Organizations and Development Partners, Honorable Peter Akpatason noted that the essence of the public hearing is to gather expert information from stakeholders to inform their rule-making obligations. He called for an objective and fair atmosphere for debate. After the chairman’s opening remarks and the introduction of organizations that submitted memoranda on the Bill, the debate on the Bill kicked off. 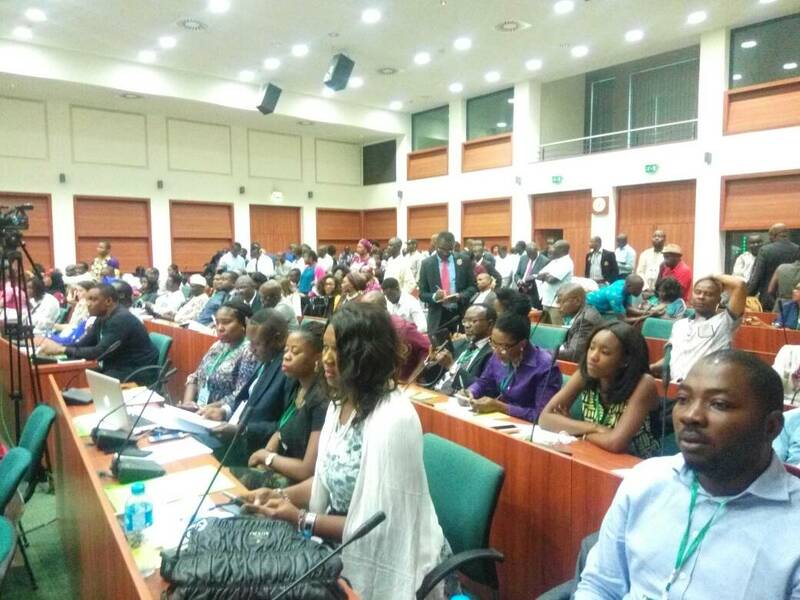 Presenting their no-holds-barred memoranda and presentations, leaders of Nigerian civil society organizations made several submissions and public statements, with the majority saying NO to the proposed legislation. They argued that there is sufficient legal framework for regulating civil society and charitable operations in Nigeria. The Health Sector Reform Commission remarked that the ‘bill will sentence women and children to death’. He cited the example of the recent outbreak of meningitis in the north, where they had to import vaccines at short notice. If the bill goes through, they would have to go through exhausting bureaucracy and increase in medical time to respond to health emergencies. This, they argued, will expose women and children to death. For Interfaith City Mission (ICM), the bill is ambiguous especially in relation to faith-based organizations. The Bill subjects churches to double registration and restricts religious bodies from operating in certain areas, violating freedom of worship. Examples include Section 18 that empowers the Commission to cancel or suspend certificates, and Section 21 that gags faith-based organisations by empowering the Commission to refuse to renew certificates. ICM argued that these provisions are unconstitutional and the bill will subtly subjects churches to taxation through the back door. The Institute of Chartered Accountants of Nigeria (ICAN) argued that the powers of Corporate Affairs Commission (CAC) are so broad and sufficient for regulation of NGOs, especially Part C of CAMA. ICAN also made mention of the Nigerian Financial Council which examines financial inflows and transactions of NGOs and other corporate bodies. For ICAN, the evidence of advantage lies in the direction of strengthening existing bodies and not duplicating roles. The Center for Social Justice argued that Section 20 of the Bill vests enormous discretionary powers on the Minister of Interior while Section 15 which makes claims related to the national interest, is vague. Unchecked discretionary power is often prone to abuse. BEARS Foundation raised questions about Section 29 which talks about ‘surrendering assets to the NGO Commission’. Why should NGOs have to submit their assets to the NGO Commission? In their group submission, the forum of International Non-Governmental Organizations working in Nigeria posited that the crisis in the North-East has affected over 7 million people, and they are on the field acting for the sake of humanity. The bill, if passed. will pose a grave challenge to their humanitarian efforts. Similarly, Amnesty International rejected the provisions of the bill on the ground that violates freedom of expression and attempts to limit how individuals organize themselves. Amnesty urged the House Committee not to criminalize citizens’ free expressions. Strong opposing the proposal to establish another regulatory body for NGOs, the Federal Ministry of Budget and National Planning argued that the Bill clearly duplicates existing ministerial functions with particular regard to the registration of international non-governmental organisations. Some sections of the bill seek to replicate the statutory functions of the National Planning Commision (NPC) especially as it relates to managing multilateral and bilateral economic co-operation, including development aid and technical assistance programming. NPC advocated for the strengthening of existing regulations in place of duplicating functions. Center LSD observed that the Bill will defeat the principles of cooperation between government and citizens subscribed to in the Open Government Partnership. In effect, this will stifle citizen participation in governance. Centre for Democracy and Development (CDD) noted that the bill will put organizations like theirs at risk. The ‘bill is fit for jurisdictions like Russia and Egypt where the civic spaces are completely shut down’, CDD submitted. Therefore, the Committee should kill the bill and send it to mother earth. Funmi Akinyele of NNNGO argued that the restrictive proposals of the bill would make it difficult for organizations to plan projects. For organizations like NNNGO that is hundreds of kilometers away from Abuja, finding the resources to come to Abuja to seek approval for projects would be an uphill struggle. Determining the fees for registrations, renewals and other requirements would be subject to the whims and caprices of the Commission, and this would potentially make effective planning difficult. Seun Onigbinde of BudGIT representing Open Alliance remarked that the sponsor of the bill ought to have been present to defend the bill. The Bill establishes the Governing Board for the Commission and vests the powers of appointment in the President. By implication, the executive will control this Commission leading to the emasculation of the civil society. In his final comments, he advocated for self-regulation by NGOs and urged the House Committee to respect the terms of the Open Government Partnership Nigeria signed onto in May 2016. SPACES FOR CHANGE’s Victoria Ohaeri contended that the Bill violates a number of constitutional provisions and will roll back the marginal gains Nigeria has made on the ease of doing business index. S4C’s director objected to Section 11 that talks about licensing and registration in one breath. According to her, the two do not mean the same thing. Registration confers perpetual status of legal personality capable of suing and being sued while licensing connotes a temporary status that could expire and also be renewed. Citing the ruling of a Supreme Court judgment in Gani Fawehinmi and Nigeria Bar Association, she further argued that compulsory registration provided in Sections 11-16 of the Bill is alien to Nigeria’s legal jurisprudence. Not only that, in the context of the current recovery from economic recession, where is the government going to get the funds to run another new regulatory agency? What about the regulatory overlap that would ostensibly result from having multiple institutions playing similar statutory functions? This will inject confusion in corporate governance and should be discouraged.